Demega formulations India is a prime exporter for multivitamin supplements are a good choice for health conscious people who want to give their body the right nutrients. A regular diet may not always be able to supply your body with the daily nutritional requirements. 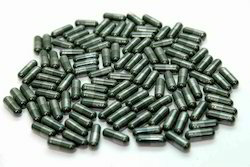 It helps to improve general bodily functions and promotes overall well being. However, it is important to specify appropriate supplement nutrients for individual requirements. For instance, someone suffering from heart diseases would require CoQ10 for preventing that particular condition. 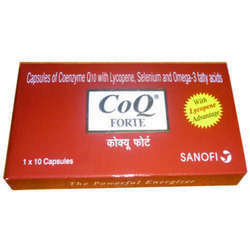 Demega formulations INDIA is a major exporter of Co Enzyme Q10 used a dietary supplement for Congestive heart failure, diastolic dysfunction diseases, in Migraine headaches,in Male infertility,in Cancer,in Parkinson's disease. In diseases there is reduced biosynthesis which increase the demand for "CoQ*300(co enzyme)" in the body an energy carrier. "CoenzymeQ10)" is marketed in USA ,UK, by brand names"ubiquinone, ubidecarenone". DEMEGAFORMULATIONS INDIA is the major exporter of multivitamin preparation "CoBaDex CZS"which ensures active life as it relieves fatigue,improves glucose metabolisim. 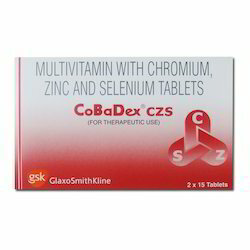 "CoBaDex CZS" is for senior citizens with vitamin & mineral deficiency even office going people in stress.Use in disease conditions involving high oxidative stress, such as diabetes mellitus, ischemic heart disease, COPD etc. Treatment of Vitamin B6, B12 and folic acid deficiency states particularly in patients recovering from chronic illness or debilitating state. Demega formulations India is known exporter of Ginseng Vitamin Minerals Capsule the perfect vitamin mineral capsule anatural suppliment for regaining vitality in over 40 individuals having vitamin & mineral deficiency. 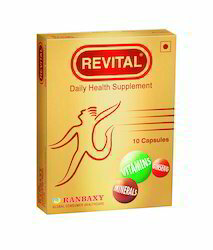 "REVITAL(Ginseng Vitamin &Minerals)"capsule is highly admired for its effectiveness. Demega formulations India is a prime exporter of Multivitamin Primrose Oil. 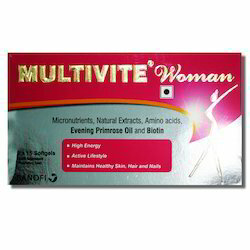 Our offered multi vitamin capsule are safe for post menopause ,weak ,old age,,maitains healthy skin and active life "multivite gold" is also available for genralised weakness and cancer patients. It cure, treat or prevent practically everything-from rheumatoid arthritis, breast pain, hot flushes, premenstrual syndrome, eczema, psoriasis, dermatitis and dry skin, relief of allergies, reducing joint inflammation and swelling asociated with arthritis, promoting healthy heart function, blood pressure and cholesterol levels. It is edible and a very good source of gamma-linolenic acid, an essential fatty acid that is not found in many plant sources and has numerous vital functions in the body. It also increases skin hydration and moisturizes dry, aging and chapped skin. Demega formulations India is a major exporter of Cholecalciferol Capsules (Cholecalciferol Vit D3 1,000 IU) and DVION 60K PEARL -(Cholecalciferol Vit D3 60,000 IU )in form of cholecalciferol is activated by 2-step process(1) Prevention and (2)Treatment of vitamin D deficiency states.DVION PEARL and DVION 60K PEARL promote calcium absorption in the Gut and maintains physiological serum calcium and phosphate concentrations that help in mineralzation of bone and to prevent hypocalcemic tetany. Demega formulations India is major exporter of "D-Rise 60000 IU(vitamin D3-Cholecalciferol 60000 IU)"used in hypothyroidism,in kidney disease to keep calcium levels normal and allow normal bone growth .Vitamin D deficiency is epidemic in India despite of plenty of sunshine. 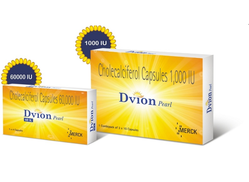 "Cholecalciferol 60000 IU"marketed in USA UK by brand name"DVION"
Looking for Multi Vitamin Medicine ?